In July 2009, the Lukić cousins, Milan and Sredoje, were convicted by the International Criminal Tribunal for the former Yugoslavia of war crimes committed in Višegrad, a town in Eastern Bosnia, between 7 June 1992 and 10 October 1994. Milan Lukić was a leader, and Sredoje Lukić a member, of the “White Eagles,” a special military unit under the authority of the Bosnian Serb Army. The White Eagles terrorized many other towns in eastern Bosnia as well, including Zvornik. As part of the general pattern of “ethnic cleansing” that characterized the founding of Republika Srpska, the Bosnian Serb Army forcibly displaced some 10,000 Bosnian Muslims (Bosniaks) from the Višegrad municipality and destroyed local mosques. The mosque in the center of Višegrad, for example, was leveled, and it has not been rebuilt. In addition, Serb forces murdered nearly 3,000 Bosniaks in the Višegrad area. The murders were both systematic and random. Under the local “Crisis Committee” that coordinated civil and military units, many community and religious leaders were identified and targeted. Other residents were caught in periodic round-ups. The Lukić cousins themselves were convicted of two separate incidents of forcing 120 civilians into two houses and setting the houses on fire, killing nearly all of the occupants: women, children and elderly. Many other civilians were viciously murdered on the town’s Ottoman bridge and on the riverbank. Their bodies were thrown into the Drina river. It is estimated that nearly 1,000 of the victims are still missing. Upon the reading of his guilty verdict in 2009, Milan Lukić--who had been apprehended in Buenos Aires in 2005-- shook his head, expressing his disdain and denying his crimes. His denial is indicative of widespread denial in Višegrad and in Republika Srpska today. This past July 12, the day after the commemoration of the 15th anniversary of the genocide at Srebrenica, the Prime Minister of Republika Srpska, Milorad Dodik, denied that the genocide at Srebrenica had occurred. However, recent work on a nearby dam caused the level of the Drina river to drop dramatically. In defiance of the denials of Lukić and Dodik, the bones of the victims were suddenly visible on the riverbanks and in the riverbed. 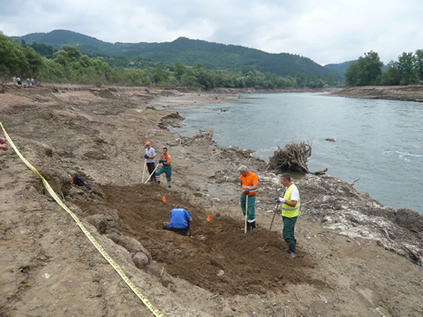 The Bosnia Missing Persons Institute (MPI) was able to begin combing the riverbanks and marking the bones. Here a bone protruded from the mud, there a collection of bones was visible on the surface: a finger, a radius bone and a vertebrae. Yellow flags marked the bones and orange flags marked unexploded grenades and shells. During one of their first forays on July 27, the Institute’s team was fired upon by an unidentified gunman. Approximately a week later, on August 4th, the Institute organized a convoy to return to the site with forensic investigators from the International Commission for Missing Persons, as well as public service workers from Sarajevo (parks and mortuary employees) equipped with tools to assist in the task of scraping away layers of the riverbed. The Missing Persons Institute’s director, Amor Mašović, along with his staff and the specialists from the International Commission for Missing Persons (ICMP) -- young professionals from the US, England and Canada-- spent hours working on the riverbed, exposed to potential snipers, unexploded ordnance and poisonous snakes. Each ICMP forensic investigator was assigned five public employees. Under the careful guidance of the ICMP specialist, the workers began digging at the mud on the surface. As the bones beneath became more visible, the forensic specialist would move in and do the delicate work of clearing the mud and freeing the skeleton from the riverbed. In one location alone, near Mušići village, a tangle of four or five full skeletons was soon to be revealed. The identification of the bones will help bring some closure to the surviving relatives of the victims. Further, these discoveries will offer additional proof of the war crimes that were committed in Višegrad, crimes for which only a few of the perpetrators, including the Lukićs, and Mitar Vasiljević, have been convicted. The value of this work, then, cannot be underestimated as part of a continuing effort to uncover the truth of the genocidal crimes in the face of official denials. In the town of Višegrad today, there is small park in honor of Ivo Andrić, --author of the Nobel prize-winning novel Bridge on the Drina—located at the entrance to the Ottoman bridge that was constructed from 1571 to 1577. Directly across the street, a poster is clearly visible on a storefront. The poster bears a color photograph of the indicted war criminal Vojislav Šešelj, founder of the Serbian Radical Party. His head is framed by the insignia of the White Eagles, a symbol of Serbian nationalism and also of the military unit responsible for many of the acts of depraved violence against the Bosniak civilians in Višegrad. The poster bears the phrase “Free Šešelj! [Слобода Шешељу-Sloboda Šešelju.] For Bosniaks who would seek to return to their homes and neighborhoods in Višegrad, as part of the social reintegration promised by the Dayton Peace Accords, this poster is a form of cruel psychological violence. The bones in the Drina, however, and those who are laboring to uncover the truth that rests in the riverbed, say that these crimes will not be denied and these victims will not be forgotten. Post script: by August 18, 2010, it was reported that 73 skeletons had been found. LINK here to photographs that accompany the report. This report is a result of two visits to Višegrad, July 31 and August 4, 2010, as well as research and personal interviews. My thanks to Amor Mašović, Director of the Bosnia Missing Persons Institute, for inviting me to accompany the convoy August 4th, 2010. Thanks to my friends Aldin Hadžić, Hikmet Karčić, Velma Šarić, Omer Sulejmanović, and Jack Hitt, for all their help in the preparation of this brief report. Special thanks to Rialda Ocuz at BHRT.